Last Monday she was on the podium at Tryon receiving her silver medal and on Saturday she was competing at Ballyvannon. 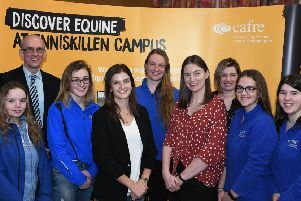 Such was the adulation for Sarah Ennis and her Irish Eventing Team success that many travelled to the Co Antrim venue to see her in person. She certainly rose to the occasion, taking time to talk to everyone, sign autographs and show her silver medal and Longines watch in its beautiful presentation box. All credit to the Glendinning family and Tony McManmon who pulled out all stops on Thursday after hearing that Sarah had joined the list of entrants to make her visit a memorable one. They adorned the keyhole jump on approach to the water fence, Sarah’s Silver Splash, with appropriate signage depicting her name, silver medals and WEG. This provided a very suitable backdrop for photographs prior to the start of cross country. The welcome and atmosphere at Ballyvannon is always very warm and this year was no exception, with the sun gracing us with its presence throughout. Denis Currie rose to the fore in the O/CNC1* class on Arodstown Aramis, his very accomplished gelding by Shannondale Sarco St Ghyvan with whom he has enjoyed eight wins this year. They finished over two points clear of Neil Morrison and Ruth Porter’s Vecta gelding, Shannador. The CNC1* class saw our silver medallist, Sarah Ennis take the top two spots. She won with Eilish Arkwright and Sarah Odlum’s lovely six year old dun gelding, Tullabeg Tango, adding just a few cross country time penalties to her first phase mark to gain a nine point margin over her own bay mare, Shanbo Skyfall. The Rowlatt-McCormick family are really enjoying immense success on a weekly basis. This week was the turn of older brother Ben who kept a clean sheet on both jumping phases with the Natal sired gelding, MJI Cabernet to gain a slight margin on the first phase leader and Knockany winner, Hollie Smith and Anvil Lodge Pinnochio who lowered one coloured pole. There were just two Pony 2* starters and, sadly, the only finisher was Katie McKee on the Connemara bred gelding, Fair Lad. This week the win in the Amateur 1* class went to Holly McClenaghan and Miranda following the unfortunate parting of company cross country by the early leader, Emily Morris and Florida Bud. Taking the runner up position was a euphoric Ann Bowe and her home bred gelding, Little Autumn Bee who made the transition to this level effortlessly. Another Amateur rider enjoying a great season is Hilary Redmond who claimed the spoils in the 100 class on board her nine year old Luidam gelding, Pulldoaran who hasn’t been out of the top five in as many outings. They added just two time penalties to their first phase mark to finish ahead of Lynsey Napier-Sneddon and her Porsch gelding, Carsonstown Porsch. This hard working combination has been in great form and nipping at the heels of the class winners for a number of weeks. Rose de Montmorency enjoyed her first win in the EI 100J class with her mother’s five year old gelding, Rickamore Notion, having benefitted from the elimination of the first phase leader, Emily Nolan. Julia Herron moved up four places from dressage to occupy second spot on Solitaire Rusty Brown. The reins of Mon Ami Tonnerre were handed over to Darragh Hanlon this week in the EI 100P class and he certainly kept the result sheet clean by taking the win and adding a fraction of a time penalty to his flatwork mark, finishing almost three points clear of Sarah Moore and her lovely grey pony, Kilgarvin Morning Misty on just their second outing. Janie Cairns claimed victory in the EI 100 class with her five year old Beach Ball mare, Kensington Beach, in a class where showjumping created some changes to the early leaderboard. David O’Connor slotted in behind, just 0.35 points adrift, on the very striking skewbald gelding, House Elf. Paul Caves had a very well deserved win in the EI 90 class with Kereen Companion, who made his first outing at Finvoy. They finished on a very impressive dressage score of 24, ahead of second placed Sarah Turley on her Connemara bred gelding, Chestnut Hill Merlot- a partnership of just five weeks! Sarah Logan from Lusk, Co Dublin, enjoyed her trip to Ballyvannon, as she claimed victory in the EI 90 Amateur class with her ten year old gelding, As if by Magic, replicating their performance at Lisgarvan the previous week. Slotting into second place, just marginally behind was the Kircubbin winner, Claire Liddle and Ballytrim Molly. Simone Leathem may have been the only competitor in the EI 90 P class but she didn’t let that deter her in delivering a super performance with a double clear jumping, adding just some time faults to her first phase score. The combination also won on their last outing at Tullylish in July. Northern Region extends a huge thank you to Danny, Grace and Paul Glendinning for hosting this event and providing an excellent day of sport. Thanks to Tony McManmon for his creative course design and to Noel Fitzpatrick and the rest of the team for course building. A spokesperson commented: “Since this is the final NR event of 2018, we extend thanks to all the landowners who have opened their gates to us this year and without these marvellous venues we would not have a sport. “Thanks, too, to all our sponsors who have been very loyal over the years. Your contribution is hugely appreciated as is your support and association. “Finally, heartfelt thanks go to each and every volunteer who has helped this year. We are most fortunate to have this pool of hard working, professional supporters. The next event for Northern Region is the Annual Awards Ball which takes place in La Mon on Saturday, November 17. Tickets are on sale via the Eventing Ireland website. O/CNC1*: 1. Denis Currie, Arodstown Aramis; 2. Neil Morrison, Shannador; 3. Daniel Brown, Fleur de Lis; 4. Sarah Ennis, Sugar Bunnie. CNC1*: 1. Sarah Ennis, Tullabeg Tango; 2. Sarah Ennis, Shanbo Sky Fall; 3. Janie Cairns, Premier Charlie. CNCJ1*: 1. Ben Rowlatt-McCormick, MJI Cabernet; 2. Hollie Smith, Anvil Lodge Pinnochio; 3. Hannah Morrow, My Good Thyne Girl; 4. Katie O’Reilly, Indian Dreamer; 5. Sam Carey, Blessington Kamikaze. CNCP2*: 1. Katie McKee, Fair Lad. CNC1* Amateur: 1. Holly McClenaghan, Miranda; 2. Ann Bowe, Little Autumn Bee; 3. Abby Coakley, Shannondale George; 4. Denis Coakley, Prince Louis; 5. Aoibheann Morgan, Hey Aussie; 6. Holly McClenaghan, Blacklaw Pelorus. EI 100 Amateur: 1. Hilary Redmond, Pulldoaran; 2. Lynsey Napier-Sneddon, Carsonstown Porsch; 3. Dawn Clerkin, The Sailors Girl; 4. Reese Hogg, Cyrano Hilltop; 5. Grainne Baxter, Cillbhrid Splash; 6. Olivia Johns, Lagans Peter. EI 100: 1. Janie Cairns, Kensington Beach; 2. David O’Connor, House Elf; 3. Neil Morrison, Dilly Diamond Queen; 4. Janie Cairns, Cross Georgina; 5. Joanne Jarden, Quarryhill Calypso; 6. Leah Jackson, Gemily. EI 100P: 1. Darragh Hanlon, Mon Ami Tonnerre; 2. Sarah Moore, Kilgarvin Morning Misty; 3. Ellen Ward, Phoenix Delight; 4. Matthew Love, Rockislands Dara Og. EI 100J: 1. Rose de Montmorency, Rickamore Notion; 2. Julia Herron, Solitaire Rusty Brown; 3. Helen Sinton, Ashtree Apple Blossom; 4. Katherine Duffy, Slaneyside Aldatus Flight; 5. Felicity Johnston, Fernisky Fantasy. EI 90: 1. Paul Caves, Kereen Companion; 2. Sarah Turley, Chestnut Hill Merlot; 3. Alexandra Russell, Milky Way Van Het Lindehof; 4. Holly McGahan, Miss Candy Crush; 5. Holly McGahan, Queenie; 6. Patrick Carey, SCSH Barnaby. EI 90 P: 1. Simone Leathem, Knockjames Jedward.